BOOTS 2 is case sensitive. Please retry login changing to "All Caps" or "All Lowercase". BGA, connectors, LGA, QFN, etc. We use Fine Grain stainless steel which has been proven to be the best stencil material for paste transfer efficiency. The stencils are then cut using the most advanced laser systems from LPKF Germany, the G6080. Fast & Accurate Depaneling Of Either Flex And Rigid Arrays! System to depanelize PCB arrays. Our ReBall System is both elegant in design and a snap to use. Invented to save you both time and money, it’s no wonder that it’s the most popular reballing system in use ! The anodized frames and hardware are fully reusable. For different parts, we provide modular foil sets and a part specific drop in aluminum nest. Beam On has developed an innovative way to fabricate press fit dies. The design incorporates easily machinable aluminum with laser cut stainless steel to offer unmatched performance at a low cost. All press fit dies are custom designed for your specific connector thereby assuring that they fit the connector perfectly. Four boards compared using Parmi data from 459 components. Two were printed through pre-Epocoat and the other two printed post Epocoat. All four boards were single printed. Comparison of Height, Area, Volume, Area%, Volume% and X/Y offsets were taken. 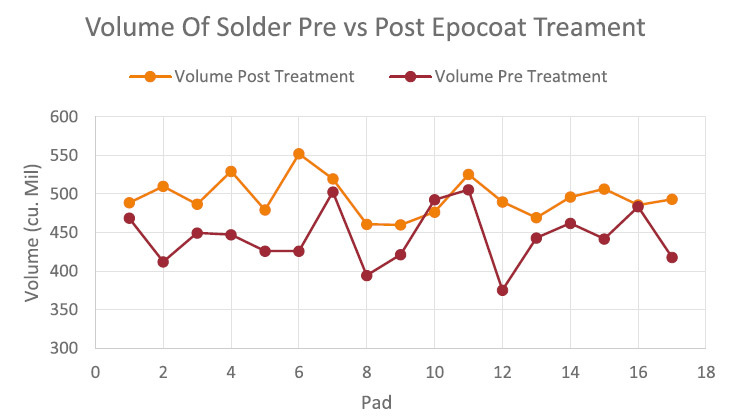 Below is a graph showing the volume of 17 randomly selected pads from the Pre Treatment prints. The data from matching pads of post treatement prints were then matched up to compare the results.